“Sara’s Cooking Class” launched this week aimed at tween girls aged 7-12 interested in cooking games and preparing food from scratch. 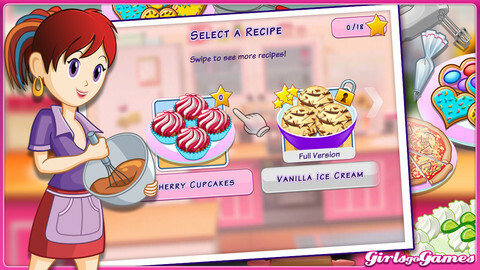 Based on the popular free desktop game on GirlsgoGames.com (with over 1 billion game play downloads), “Sara’s Cooking Class” encourages girls to make different recipes with the help of their gaming cooking guide, Sara. The purpose behind “Sara’s Cooking Class” is to get kids playing with a recipe in the app, and involving parents to help them create the dish in the kitchen and help them explore ingredients. There is a free lite version with two recipes to choose from, but the paid version has more recipes, like homemade pizza, sushi rolls and red velvet cake, and is a better experience all around. As players follow the recipe steps, they earn points competing against a kitchen timer, and Sara awards stars as prizes at the end of each level. “Sara’s Cooking Class” is available in a lite or premium version on iTunes, or the Amazon Appstore for $2.99.